EVE Online is about to get its biggest, most expensive warship ever: the Molok. A version of the game’s giant Titan spaceship that’s aligned with the Blood Raider pirate faction, it’s going to cost three to five times the price of an Avatar-class Titan. But all that cash outlay comes with serious benefits, like the fact that you can store 100,000 human corpses in its custom meat locker. Yay! The Molok, which will be included in the MMO’s May update, will cost somewhere in the neighborhood of 300 to 500 billion units of ISK, the game’s currency. That means if you were to want to buy one with real-world cash, it could cost you anywhere from $5,000 to $8,000. By comparison, the current most expensive base model Avatar Class Titan ship goes for about 100 billion ISK. 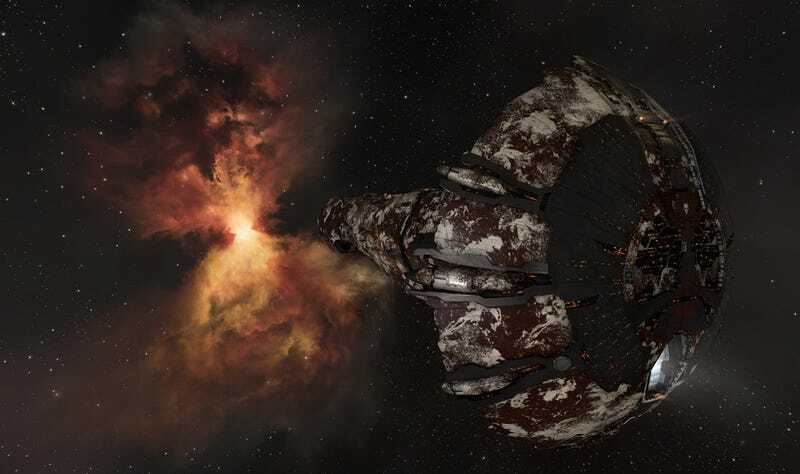 In EVE Online lore, the Blood Raiders are a deviant pirate faction with a literal bloodthirst: They roam the stars, preying on people and draining their blood for ritualistic purposes. So it would only make sense that their ships would have body storage, and the Molok does not disappoint with its dedicated Corpse Bay, which has 200,000 cubic meters of meat space. At 2 cbm/person, that’s 100,000 human corpses that you can traipse around the galaxies with, if you so choose. Where do the bodies come from? When a player’s ship is destroyed in EVE, they’re ejected inside a life-sustaining escape pod. But if this pod is destroyed, their corpse is left behind as a grim trophy for their enemy to recover, if they so choose. Human corpses have no in-game use, although players do buy and sell them occasionally—as each corpse is tagged with the deceased’s name, famous (or infamous) bodies can sell for a substantial sum. I don’t want you to think that EVE now boasts a fully-rendered room full of dead bodies that you can while away your leisure hours in. Your corpse tally is just a number on a spreadsheet. And no, if your grotesque ship of cadavers is destroyed, thousands of dead bodies won’t all float out into space, as awesome as that would be. If any of them survived the explosion they’d just be represented as a single abstract item for somebody to pick up. Molok and other Blood Raider ships do have a useful feature: they grant a bonus to the “Energy Nosferatu” devices that let you drain the power from enemy ships to use it for yourself. You can’t actually do anything with that fridge full of corpses, though. Personally, I try to retrieve my own dead bodies, and those of my friends. Thinking about them being used as trophies on other people’s ships is just plain weird. Lee Yancy has been an avid gamer for as long as he can remember, but ever since discovering them, he has found himself almost completely absorbed in MMO style games. EVE Online and World of Warcraft dominate the majority of his time.